Looking for a French bistro in the West End? Le Parisien fits the bill. The West End’s brand new French bistro is about as authentic as they come here in Vancouver. With a menu boasting three tartares, roasted bone marrow, a cassoulet and more, the chances of finding your favorite French dish are high. Le Parisien is the informal sister of Bistro Pastis, owned by John Blakely, whose first serving job in our city was, serendipitously, at the 751 Denman Street location (then Cafe de Paris). 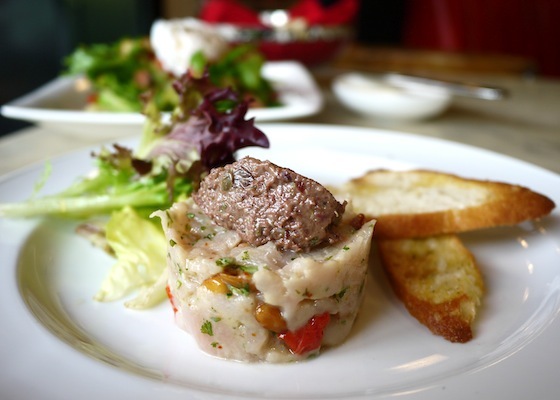 Executive chef Tobias Grignon has created several original dishes including an Albacore Tuna Tartare that was pretty as a picture, riddled with toasted pine nuts and oven roasted tomatoes, and topped with a hefty dollop of delicious olive and caper tapenade. The strong flavors – which I enjoyed – dominated over the tuna, which didn’t taste top notch. The Salade Lyonnaise arrived with a whiff of truffle oil. Lean house cured bacon peeked out from the escarole, a soft poached egg perched on top. Crunchy house made croutons dipped in yolk was a highlight, as was the helpful service.